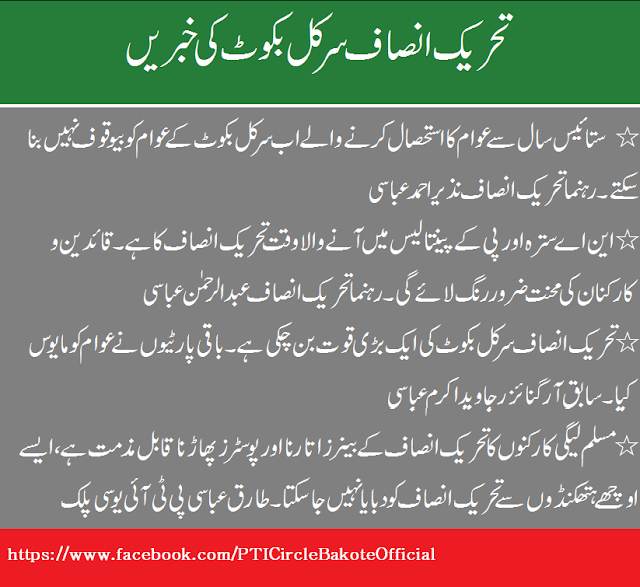 Circle Bakote is a part of District and Tehsil Abbottabad and lies in NA-17 and PK-45. PML-N leader Sardar Mehtab Ahmad Khan who also served as Chief Minister of NWFP belongs to circle Bakote village Malkot Union Council Palak. Circle Bakote has a prime significance in the politics of Hazara and in past, it has remained a stronghold of PML-N and except 2002 elections, PML-N has got majority votes from this region all the times. However, in 2002, PML-Q candidate Aman Ullah Khan Jadoon managed to grab NA-17 seat and he served as federal minister for petroleum for five years. PTI tsunami has reached in Circle Bakote as well like all other parts of the country and PTI has become a serious threat for Sardar Mehtab Ahmad Khan MNA and his Son MPA Sardar Shamoon Yaar Khan. PTI leaders like Ali Asghar Khan, Dr Azhar Jadoon, Raja Mubeen Ur Rehman, Nazir Ahmad Abbasi, Abdur Rehman Abbasi, Tahir Faraz Abbasi, Javed Akram Abbasi and PTI Youth from all union councils of Circle Bakote is very active in mobilizing the people and in spreading PTI's message in all parts of Circle Bakote. PTI held some great meetings in Bakote, Patan, Kukmang and Dalola just after Eid and a large number of notables and youth joined PTI during these meetings. Currently majority of Ex-Nazims and Councilors is supporting PTI including Haji Abdur Razaq Abbasi of UC Palak, Nazir Ahmad Abbasi of UC Bakote, Khalid Gul of UC Kukmang, Pir Azhar Bakoti from Bakote and Tahir Faraz Abbasi a renowned lawyer. The real problem for PTI is to ensure unity among its leadership and workers at such a critical time when its yet unclear who will get National Assembly and Provincial Assembly ticket of PTI. For national seat, two potential candidates of PTI are Dr Azhar Khan Jadoon and Ali Asghar Khan while for provincial seat, potential candidates are Nazir Ahmad Abbasi, Raja Mubeen Ur Rehman Abbasi, Abdur Rehman Abbasi and Tahir Faraz Abbasi. Ideological youth of PTI is determined to support the party and not any individual. They have reiterated that they will support any one who gets PTI ticket and will never support any divisions within party folds. PTI tsunami continues in all parts of the country and now, PTI is going to show its power in Liaqat Bagh Rawalpindi on 27 May 2012. Preparation for PTI Rawalpindi rally has already started and mass mobilization of public is being made by local PTI leaders. This rally has a huge significance on politics of Rawalpindi and according to political analysts, this rally will have a great contribution in defining future political trends of Rawalpindi division and surrounding areas. Histrorical ground of Liaqat Bagh is a huge place for PTI and looking at the public response to PTI rallies in other parts of the country like Lahore, Karachi, Quetta, Abbottabad, Sialkot, Mianwali and Ghotki, it doesn't look like a tough game for PTI to gather a huge public in this ground. PTI is active in Rawalpindi, Murree, Taxila and other surrounding areas under the leadership of an energetic young man Sadaqat Ali Abbasi who leads PTI North Punjab. Sadaqat Ali Abbasi who basically hails from Murree is one of the oldest PTI leaders who are with Imran Khan from the very begining. He has done a great work in past in strengthening PTI at grass root level in all parts of North Punjab. Now, after joining of some notable political personalities of Rawalpindi; including ex-Federal Minister Ghulam Sarwar Khan from Taxila, Raja Rashid Hafeez, Rahat Masood Qudoosi, Fiaz Ul Hasan Chohan, Ijaz Khan Jazi etc, PTI is in a good tempo in district Rawalpindi. Campaign has already been started by PTI Rawalpindi leadership to persuade people to attend the jalsa and a very positive response has been observed in general public. Student Wing of PTI (ISF) and women wing is also very active in this regard. PTI Social media team has also started its active work for PTI Rawalpindi Rally. Some analysts are predicting that Sheikh Rasheed Ahmad who is leader of Awami Muslim League may also announce to join PTI or may announce merger of his party with PTI in this Liaqat Bagh Jalsa, however yet no confirm reports about this has reached to us. According to central spokesperson of Imran Khan--Zahid Hussain Kazmi, PTI rally in Rawalpindi will mark a new histroy. Next general elections in Pakistan are scheduled to take place in 2013 if current government completes its tenure and all political parties are already very active on ground in preparation for the elections. With a high rise in unemployment and inflation, with poor law and order situation and all sorts of internal and external problems; PPP led coalition government is having a very low graph in public and public sentiments have gone too much against the government making it favorable for other parties. Imran Khan's led Pakistan Tehreek e Insaf has emerged as a great political force and a viable third force in the political atmosphere of the country. PTI continues to show huge public support and street power in its massive rallies in different parts of the country. PTI tsunami got a momentum after its historic jalsa in Lahore on October 30, followed by another historic rally in Karachi on 25th December. Both rallies were attended by hundreds of thousands people and these rallies totally changed the political landscape of the country. After these two rallies, a large number of political heavyweights joined PTI including Javed Hashmi, Shah Mahmood Qureshi, Azam Swati, Khursheed Kasuri, Sadar Asif Ahmad Ali, Khan Muhammad Hoti, Jehangir Tareen, Iftikhar Gilani, Masood Sharif Khattak, Awais Laghari, Jamal Laghari, Zafar Iqbal Waraich, Inam Ullah Khan Niazi, Ishaq Khakwani, Dr Azhar Jadoon, Sardar Idrees, Sardar Yaqoob, Usman Abbasi and dozens of other notable political stalwarts. Journey of political activities of PTI continues with a growing momentum and PTI managed to hold massive rallies in various other parts of the country including Mardan, Haripur, Abbottabad, Mianwali, Sialkot, Bhakkar, Chicha Watni and then in Quetta--the capital of Balochistan. PTI has also managed to come forward on technical aspects with a series of policy seminars on some key national matters including energy crisis and its solutions and local government system. PTI Chairman Imran Khan has also approached renowned Atomic scientist Dr. Abdul Qadir Khan to formally request him to join hands with PTI. AQ Khan has agreed to patronize PTI. PTI has also managed to induct some great minds like Asad Umar in its partyfold who have a huge professional experience. PTI Jalsa in Bhakkar concludes with Imran Khan's speech. A massive crowd. Great breakthrough of PTI in Bhakkar. Imran Khan asks people to become PTI members and choose their own leaders. Imran Khan speaking about local government system and people empowerment. Geo News, Samaa TV and some other TV stations are showing Imran Khan's speech live from Bhakkar Jalsa. PTI Chairman Imran Khan is addressing Bhakkar PTI Jalsa. Crowd is fully charged. PTI president Javed Hashmi is addressing in PTI Bhakkar Jalsa. Crowd chants the slogans of Baghi Baghi. Ex-MNA of PML-N from Bhakkar Najeeb Ullah Khan announces to Join PTI and expresses full confidence on Imran Khan's leadership. Najeeb Ullah Khan is addressing crowd in Bhakkar PTI Jalsa. Jalsa gah is jam packed with thousands of charged PTI supporters. Chairman Imran Khan has reached Jalsa gah in Bhakkar. A huge gathering welcomes him warmly. Huge crowd gathered in the ground. More than 40 thousands people in the ground. Pakistan Muslim League Nawaz (PML-N) has dominated Hazara division always and majority of national and provincial assembly seats of Hazara division have been won by PML-N with landslide margins. Sardar Mehtab Ahmad Khan who is currently an MNA and previously served as Chief Minister of NWFP (now KPK) and as minister for railways as well, belongs to district Abbottabad. Sardar Mehtab has always won election from NA-17 except for 2002 elections in which he didn't contest. Pir Sabir Shah who hails from Haripur Hazara is another prominent PML-N leader who has been winning with heavy mandate from Haripur on provincial assembly seat. Murtaza Javed Abbasi, Barrister Javed Abbasi, Anayat Ur Rehman Jadoon and captain Safdar are other key leaders of PML-N in Hazara. Despite all these facts and figures of past, now PML-N seems to be in a losing state in Hazara division due to multiple factors. PML-N got a big dent in Hazara division on the issue of renaming of NWFP as Khyber Pakhtunkhwah. On this issue, public reacted very strongly against PML-N and there is a widespread hate against PML-N in Hazara due to this issue. A wave of anti-PML-N forces erupted just on this renaming issue and a large number of political opponents of PML-N joined hands for Soba Hazara cause. However, due to some misunderstanding between Baba Haider Zaman and other Soba Hazara leaders, they couldn't work together for long. Now, after a widespread tsunami of PTI in all parts of country, waves have reached in Hazara division as well where a large number of political heavyweights have already joined PTI which include a rival and a real competitor of Sardar Mehtab--Dr Azhar Khan Jadoon, ex-deputy speaker national assembly Sardar Muhammad Yaqoob, ex-provincial minister Sardar Muhammad Idress, Ali Asghar Khan, Nisar Safdar Khan, ex minister and senator Azam Khan Swati, a key political leader of Mansehra Zargul Khan, Ex-district Nazim of Haripur Raja Amir Zaman, Yousuf Ayub Khan and dozens of other local leaders. PTI held a historic Jalsa in Abbottabad on 8th April which is considered as biggest political rally in the history of Hazara division. More than 100 thousand people gathered in this jalsa. After such a massive rally of PTI in Abbottabad and joining of a large number of key political leaders of Hazara, now situation seems tense for PML-N and it seems that now the monarchy of PML-N in Hazara division is about to persih. National Anthem being played. People stand up in respect. Imran Khan supports formation of new provinces including Hazara province on administrative basis. He thanks people of Hazara and concludes his speech. PTI Chairman wows to eradicate injustice by reforming patwari and thanedar system. PTI Chairman Imran Khan addressing. We will bring reforms in the system. We will bring power to the public through local government system. Javed Hashmi--PTI President is speaking to the public. He wows to nab the looters. He says that youth is with us and we will bring a change. Shah Mahmood criticizes government and its allies for price hike. Shah Mahmood supports Hazara Province movement and says that people of Multan and Hazara have similar demands. PTI Vice Chairman Shah Mahmood Qureshi speaks to the public in his usual emotional way. Crowd responds warmly. Slogans of PTI everywhere. PTI Youth Wing President Abrar Ul Haq is addressing. Crowd has welcomed him warmly. PTI KPK president Asad Qaiser has already completed his speech. Asghar Khan's son--Ali Asghar Khan has spoken to the crowd. PTI leader Azam Khan Swati is speaking to the crowd. Crowd fully charged and chanting slogans of Insaf. Raja Amir Zaman--PTI Haripur Leader is addressing now. Asif Zubair Shaikh--PTI Abbottabad leader is addressing the crowd. Sardar Sher Bahadur is addressing. Local PTI leaders Dr Azhar Jadoon, Sardar Idress and Waseem Shehzad have addressed the crowd. Waleed Iqbal--grandson of Allama Iqbal speaking to the crowd. PTI Vice Chairman Shah Mahmood Qureshi is also on the stage. Javed Hashmi has reached the ground. The crowd chants the slogans of Baghi Baghi. Imran Khan reaches Jala Gah. A warm reception by cheering crowd. Announcements being made that Imran Khan to reach Jalsa Gah shortly. More than 50 thousand people in the Jalsa Gah. A huge Jalsa. Historic jalsa of Hazara. Imran Khan, Javed Hashmi and Shah Mahmood to reach Jalsa Gah at around 4PM. Babar Khan--PTI Batgram president addressing the crowd. Ehsen Naveed (ISF) condemns killing of Naveed Khan Shaheed In Bannu. Degree College ground is Jam Packed. Huge crowd in PTI Jalsa. PTI Abbottabad Jalsa has formally Started with recitation of Holy Quran. Provincial Information Secretary of PTI Shah Farman has reached Jalsa Gah. Azam Swati , Abrar Ul Haq , Waleed Iqbal reaches Jalsa Gah. Huge rally of PTI/ISF Haripur heading towards Abbottabad. Local leadership reaching Jalsa Gah. More than 20 thousands people already present in Jalsa Gah. Slogans of PTI everywhere. Abbottabad city is fully charged. City is fully decorated with PTI Flags, posters, banners and hoardings. PTI is going to hold a historic rally in Abbottabad on April 8 where PTI Chairman Imran Khan, Vice Chairman Shah Mahmood Qureshi, President Javed Hashmi and other PTI leaders will address a large gathering. This jalsa is considered as a great political gathering in the history of Hazara and according to the critics, this jalsa is going to set the future trends of politics of Hazara which was earlier a stronghold of PML-N.
PTI Social Media team is very active for this jalsa and live stream of PTI Abbottabad Jalsa will be available on the official website of PTI. Minute to minute updates of PTI Abbottabad Jalsa will also be available through official page of PTI Hazara. Below are the important highlights from Today's local newspapers of Hazara regarding Abbottabad Jalsa. PTI is going to hold a rally in Abbottabad on April 8 where PTI Chairman Imran Khan, Vice Chairman Shah Mahmood Qureshi, president Javed Hashmi and other party leaders will address the gathering. Jalsa preparation are in full swings in all districts of Hazara including Abbottabad, Haripur, Mansehra, Kohistan and Batgram. Party leadership in Hazara is making all efforts to make it an histroric event and the way, people are being mobilized and looking at the current scenario, it seems that PTI Abbottabad Jalsa will be the biggest jalsa in the history of Hazara. Below are the latest news updates about PTI Abbottabad Jalsa, extracted from April 6th local newspapers of Hazara. IKF (Imran Khan Foundation) is a Non-Government-Organization, headed by Imran Khan--a well known social worker, politician and former cricketer. IKF has done a tremendous job after 2005 earthquake and then after last year's floods in various parts of the country and helped people in far flung areas to get their life restored to normalcy. Swat is a district in Khyber Pakhtunkhwah where people have suffered a lot in different forms; be it war on terror, terrorist's attacks, army operations or natural calamities like last year's floods. In the floods, thousands of people in Swat became homeless and also got deprived of their valuables which drained in the water. Imran Khan Foundation came forward to help these helpless people and started working on project of developing model villages with the help of highly professional civil engineers. Watch the documentary below which gives you a glimpse of the work done by IKF in Swat. After a historic jalsa in Lahore on October 30 and then another historic jalsa in Karachi, PTI has managed to get a huge attention of political stalwarts from all parts of the country including Khyber Pakhtunkhwah and hundreds of notables from different constituencies of Pakistan from all four provinces have joined PTI. Party was already enjoying a good popularity in general public due to it's clear and just stance on all issues of national and international levels including war on terror, corruption, judiciary and FATA. Looking at the current situation, PTI is the most popular party in Khyber Pakhtunkhwah where the graph of PTI has risen very high. In different districts of KPK, huge number of electables have joined PTI. 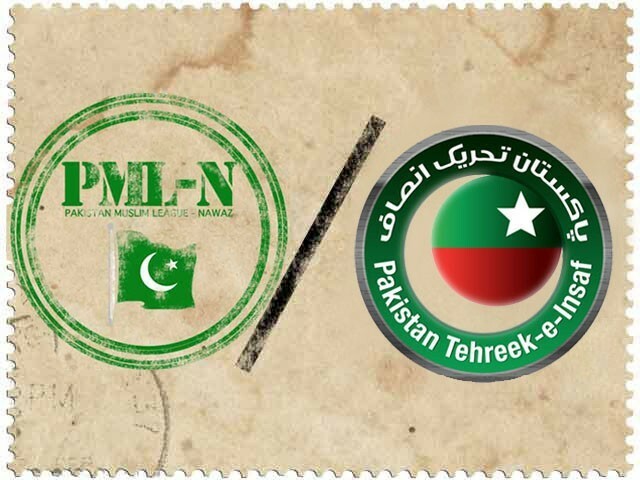 Most prominent politicians from Khyber Pakhtunkhwah who have joined PTI in recent past include Khwaja Khan Muhammad Khan Hoti from Mardan who is ex-Federal Minister and was previously affiliated with ANP, Pervez Khattak who was affiliated from PPP Sherpao and has recently resigned from national assembly to join PTI, Azam Swati who was senator of JUI from Mansehra, Sardar Yaqoob Khan who was associated with PML-Q and is ex-deputy speaker of National Assembly, Aman Ullah Khan Jadoon who was from PML-Q and remained Federal Minister for Petroleum and belongs to district Abbottabad, Sardar Idrees who served as provincial minister in MMA era and also belongs to District Abbottabad, Raja Amir Zaman who belongs to Haripur and was ex-Tehsil Nazim, Iftikhar Jhagra ex minister from Peshawar, Masood Shareef Khatak ex-IB chief who was earlier in PPP and belongs to Karak. The list of political leaders who have joined PTI doesn't end here and it's too long but this post covers only the key leaders who became part of PTI recently. From all this, it's expected that PTI will be able to grab majority seats of both national and provincial assembly from Khyber Pakhtunkhwah in next general elections. After a historic jalsa of PTI in Lahore and then another historic rally in Karachi, PTI has caught attention of politicians and public from all over the country and hundreds of notables from different parties have switched towards PTI and PTI has become a major political force of the country. Like all other parts of the country, PTI has also gained a good momentum in Rawalpindi district and many key political figures of Rawalpindi have joined PTI. Sadaqat Ali Abbasi who is Organizer of PTI for Northern Punjab is doing a great work in this regard and he has worked day and night for last several years to strengthen the party at grass root level in all Tehsils of District Rawalpindi. Recently Rashid Hafeez Ex MPA has joined PTI who is a well known political figure of Rawalpindi. Joining of Rashid Hafeez in PTI has given a great boost to PTI in Rawalpindi. Rashid Hafeez was elected an MPA on PML-Q ticket in 2002 elections. Apart from Rashid Hafeez, Raja Tariq Mahboob Kiyani has also joined PTI from Rawalpindi. Tariq Mahboob Kyani is Ex District Nazim and is a well known political figure of the Rawalpindi region. After joining of Tariq Kiyani, political activities of PTI in district Rawalpindi have significantly increased. Another well known politician of Rawalpindi who recently joined PTI is Rahat Masood Qudoosi who joined PTI after meeting party Chairman Imran Khan. Pirzada Rahat Masood Qudoosi runs a well known School System in Rawalpindi and he was advisor of Ex-Chief Minister Punjab Chaudhry Parvez Elahi. It's important to mention here that Fiaz Ul Hasan Chohan joined PTI about a year back and he is also a very active politician of Rawalpindi. Fiaz Ul Hasan Chohan remained MPA of PML-Q by winning PP-14 elections in 2002. Fiaz Ul Hasan Chohan is very active in mobilizing PTI workers and is working hard at grass root level. After joining of these notable politicians and with the constant work of PTI workers especially ISF youth, it's expected that PTI will be able to achieve some major milestones in Rawalpindi as well like other parts of the country. Dr Azhar Jadoon who is a well known social worker, President Pakistan Doctors Associations and runner up of last elections of NA-17 as independent candidate has formally announced to join PTI after having a meeting with PTI chairman Imran Khan at his residence in Islamabad. Dr Azhar Jadoon is a very popular political figure of district Abbottabad who is very active at grass root level throughout the district for last several years. He contested elections in 2008 as an independent candidate against Sardar Mehtab Ahmad Khan Abbasi of PML-N and Aman Ullah Khan Jadoon of PML-Q and stood second as Sardar Mehtab won that election. It's important to note here that Dr Azhar Khan Jadoon took more than 38000 votes while Sardar Mehtab grabbed 50 thousands plus votes. Getting such a big number of votes as an independent candidate shows the popularity of Azhar Jadoon in the region. Others who joined PTI along with Dr Azhar, include Zargul Khan Ex-MPA from Kala Dhaka Mansehra who belonged to PML-Q and Abdur Rehman Abbasi who was runner up in last elections of PF-45 against the son of Sardar Mehtab--Sardar Shamoon Yar Khan. Abdur Rehman Abbasi belongs to Malkot Area of Circle Bakote which is the home town of Sardar Mehtab as well. After joining of these notables from district Abbottabad, now it's expected that PTI will give a tough time to PML-N which has ruled the region for so long. PML-N has been tested twice by the people of Pakistan and they failed to deliver and couldn't bring any change in the fate of the people of Pakistan. PML-N leaders like Mian Nawaz Sharif, Mian Shahbaz Sharif are doing politics in Pakistan but their assets are outside Pakistan. This results in a lower stake of these politicians in Pakistan. Tax history of PML-N shows them as "Tax Thieves". An example is the year 2009 in which PML-N chief Mian Nawaz Sharif deposited only 5000 Rs tax. PML-N attacked on supreme court and according to Wiki Leaks, at the time of judiciary restoration movement; PML-N asked America to restore Punjab Government and they could drew themselves out of the movement without any restoration of judiciary. PML-N lacks democracy within the party and a monarchy of one family exists in the party just like PPP. After Nawaz Sharif, it's Shahbaz Sharif, Hamza Shahbaz, Maryam Nawaz, Cpatain Safdar and Abid Sher Ali as leaders in the party who are all in close family relationship with party chief. 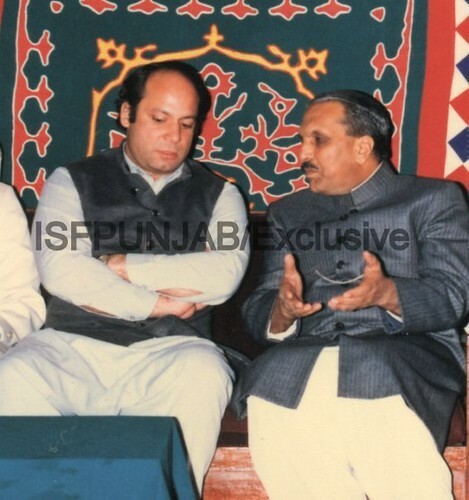 PML-N leaders ditched all parties in APDM at the time of boycotting the election under Musharraf Regime. PML-N earlier reiterated that they won't accept any PML-Q leader but now, a long list of PML-Q leaders have jumped into PML-N including Zaid Hamid, Abdul Majeed Malik, Tasneem Gardezi, Major (R) Tahir Iqbal etc. PML-N is a party which was formed by establishment and General Jilani is the main character behind formation of PML-N. PML-N has history of supporting dictators like General Zia. NRO (National Reconciliation Ordinance) is one of the most controversial ordinance in the history of Pakistan and NRO is considered as an ordinance for elite criminals to hide their sins and get a forgiveness for all that they have done by looting the resources of country and doing all sorts of corruption. The list of NRO beneficiaries is quite long and it doesn't include only politicians but also various bureaucrat's and others. Is PTI going to make any alliance or deal with Pervez Musharraf? Critics of PTI are of the view that Imran Khan holds a soft corner for former dictator Pervez Musharraf and there is a possibility of alliance between PTI and APML(All Pakistan Muslim League). However, PTI chairman Imran Khan has a very clear stance on it and he has reiterated on various occasions that any alliance with Musharraf is not possible as he has done some serious crimes which needs to be taken into the courts of justice. Yesterday, Khursheed Kasuri who recently joined PTI, met with Pervez Musharraf in Dubhai which made a big roar against PTI in print and electronic media saying that this may lead to any formal alliance/cooperation between the two parties. However, PTI leadership has made it clear that even if Kasuri met with Musharraf, it was in his personal capacity and not on behalf of party. Moreover, a show cause notice has been served to Khursheed Mahmood Kasuri for this meeting. According to reliable sources, Kasuri met with Musharraf just for a few minutes informally in a wedding and it was not a planned meeting at all. Dr Arif Alvi who is secretary general of PTI has strongly reacted on such news and said that there is zero possibility of any deal with former dictator Musharraf and PTI is clear about it. In a press release issued by Dr. Arif Alvi, it's clearly stated that it was just an accidental meeting with no political motives. Javed Hashmi who joined PTI recently has also denied any possibility of alliance with Musharraf. He said that he talked to Imran Khan just a day back and Imran Khan has categorically denied any such possibility and called it a political suicide for his party to have alliances with any such criminals. PTI has shaken the politics of Pakistan after a historic jalsa at Mazar-e-Quaid Karachi on 25th December 2011 where a huge public gathered to extend their full support for Imran Khan's party--PTI. According to media reports, more than half a million people were there in PTI Karachi Jalsa. The crowd was highly charged, motivated and they were raising slogans for change, for PTI leadership, for a new Pakistan and for removal of current corrupt government. Javed Hashmi speech in PTI Karachi jalsa was the most emotional speech which brought a lot of energy and charge in the audience. During his speech slogans like "Han Mai Baghi hon" and "Aik Bahadur Aadmi, Hashmi Hashmi" were echoing near the tomb of Jinah. He said that he joined PTI for a greater cause and for national interest as he thinks Imran Khan is the only ray of hope in current scenario and he is the only one who can bring a real democratic change in the country. He waved the flag of PTI during his speech which became a worth remembering moment for the people of Pakistan. Shah Mahmood Qureshi, who is the vice Chairman of PTI, also delivered a sentimental speech in his own way. He clarified his stance about security of Pakistan's nuclear assets and said that there is no physical threat to Nukes but policy threats are there from the current corrupt government. Justice Waji Ud Din Ahmad in his speech said that just like our elders proudly tell their children and grand children about 23rd March 1940 Jalsa, the audience of this historic jalsa will be telling to their children and grand children that they were part of this jalsa which aimed to make a new Pakistan--free of corruption and based on the principles of Justice and equality. PTI chairman Imran Khan in his speech shared PTI vision on how to bring a real change in Pakistan. He reiterated his stance on supremacy of judiciary, equality in educational system, reforms in government system, reforms in police system, free health services for poor, free education for all, special incentives for investors, special status for Baluchistan, improvement of law and order situation and various other key issues. He said that none will be above the law in PTI government and Imran Khan will also be fined if he does over speeding. Others who spoke in PTI Karachi Jalsa include Ahsan Rasheed PTI Punjab President, Asad Qaiser PTI KPK president, Qasim Suri PTI Baluchistan President, Naeem Ul Haq PTI Sindh President, Hamid Khan PTI Senior Vice President, Fozia Kusoori PTI Women Wing president, Azam Sawati, Khursheed Kasuri, Jehangir Tareen and Abrar Ul Haq.